Unfortunately, LASIK does not always work as patients had hoped. While the complication rate is small, these complications can cause significant hardships for those affected. Until now, finding a solution to correct these problems was a challenge. Dry eyes - This leads to problems with eye comfort and the need for constant lubrication to maintain eye comfort. Corneal thinning or bulging also known as ectasia. This can cause an irregular surface to the front of the eye leading to poor vision. Night-time haloes - This is common in patients who were very nearsighted prior to surgery or those who have very large pupils. For many, these complications are not easily corrected by traditional methods. That is why we have brought Scleral Lenses (sometimes referred to as PROSE) technology to our practice. These FDA-approved prosthetic devices can improve or correct any or all of the above complications. MoistureEyes Scleral Lenses are uniquely suited to correcting these problems. They are designed to vault over the diseased or irregular surface of the eye. They help to reduce pain in two ways. First, they create a protective barrier over the dry eye surface protecting the cornea from the mechanical rubbing effect of the eyelids(see Figure 1). There are more nerves per square inch on the cornea than any other part of the body. Since the eyes blink several thousand times per day, protecting this surface dramatically reduces a patient’s discomfort and irritation. Secondly for those with dry eyes, they create a liquid bandage lens between the device and the cornea. This liquid bandage lens soothes the irritated nerve endings of the eye while it is worn by reducing the drying effect of the air. The moisture chamber created continuously bathes your cornea in sterile saline micro-environment. This allows the tissues to heal and can dramatically improve the comfort of your eyes and more importantly, the quality of your life. 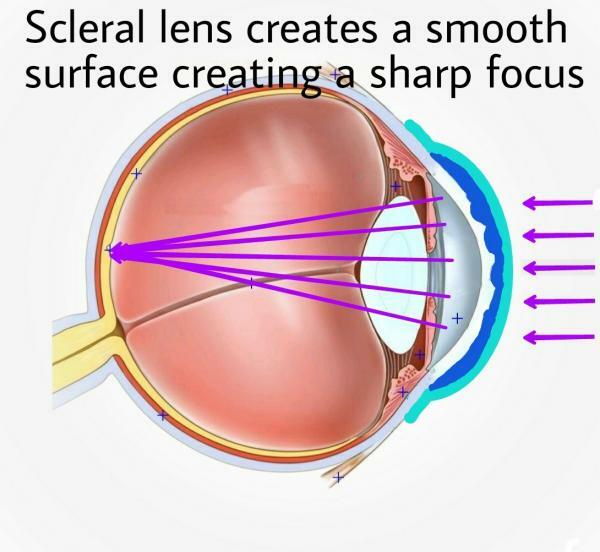 The Scleral Lenses correct the vision and haloes by essentially creating a new, smooth, uniform surface to the front of the eye thereby, masking any surface irregularities. This can improve irregular vision and minimize night-time haloes. If you have friends or family with irregular corneal conditions, please let them know about this great option. Give our office a call and schedule your evaluation today! (205) 979-3937. 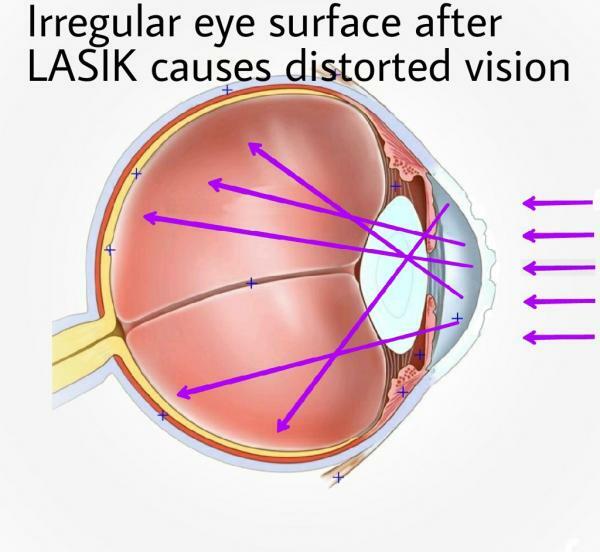 LASIK Birmingham optometrist, LASIK Hoover optometrist, LASIK Vestavia optometrist, LASIK Alabama optometrist, ectasia.